Cyberwarfare is the most serious threat facing the United States, according to almost half of over 300 US national security leaders from the Administration, Congress and the Defense industry who responded in November to the inaugural Defense News Leadership Poll, underwritten by United Technologies. But while the leaders in national security policy, the military, congressional staffs and the defense industry are united in the seriousness of the cyber threat, agreement on the next greatest threat breaks down clearly along party lines. 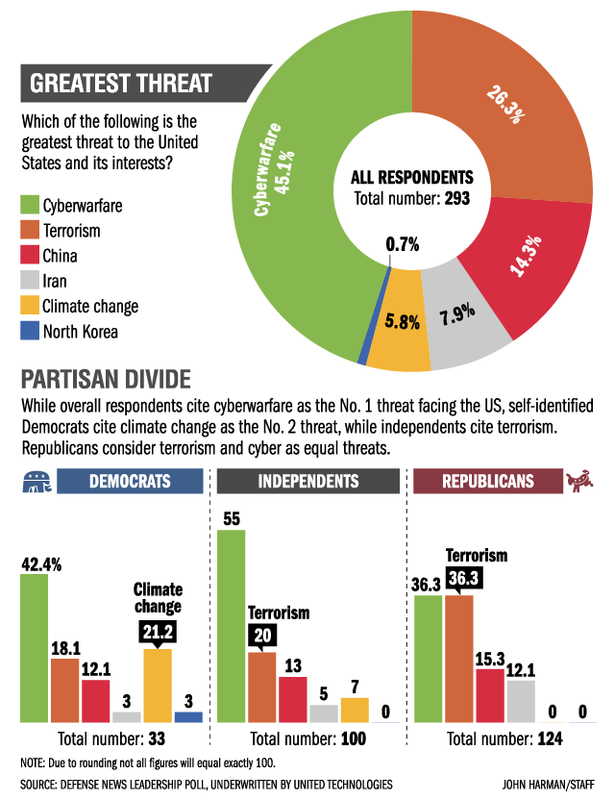 Terrorism is viewed as the next greatest threat by leaders who identified themselves as Republicans, while climate change was cited by those identifying as Democrats. The poll sheds new insight into what is often seen as a monolithic and even nonpartisan national security community. More than 350 senior defense leaders responded to the poll in late November, answering two dozen questions across the gamut of defense issues.